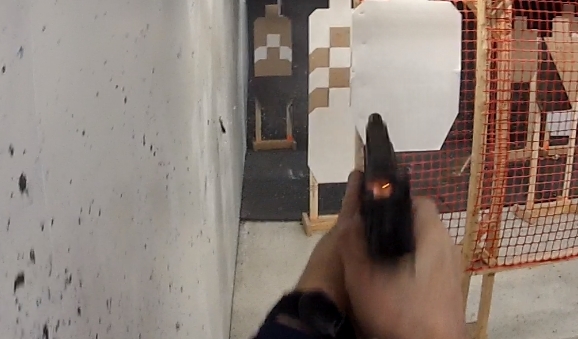 I shot an indoor match yesterday, actually it was my first USPSA shoot, and managed to get one stage on video before my GoPro died. When watching the video I noticed these small flashes of light which appeared to be shooting rearward on some of my shots. Didn't see them as I was shooting, but looking at the video frame by frame, they are clearly visible on 1/3 to 1/2 of my shots. I was shooting 150g Federal Syntech and didn't have any failures of any kind. I've shot this ammo at a few matches with no problems, but all were outdoors. The Syntech isn't cheap ammo and I'm wondering if the sparks are caused by the lower power sub-sonic pressures, where the case isn't expanding enough to complete seal within the chamber before being ejected??? Could the lighter 11# RSA be allowing the slide to move rearward earlier than a reduced factory 18# spring, causing a "timing/dwell" issue.? Maybe Federal uses a slower burning powder. I know the Titegroup I'm reloading with is a very fast burning powder. May not see it with it. I guess I'll have to experiment with some regular 115 higher velocity ammo and the factory reduced RSA and see if I can see this happening. I should look at some of the Federal shell casings to see if there is any blowback visible. 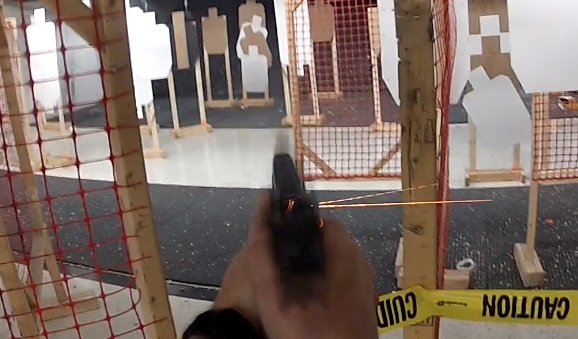 Didn't retrieve any brass at the match, but easy enough to do at my indoor range. I'll have to see if this happens with my reloads. I guess I have a few things to try. Let me know if you've experienced this or have seen it before. If it hadn't been for the video, I wouldn't have know it was happening. the casing ruptured and the side plate blew out. I had to send the gun in for repairs. It was bad ammo. Right at 1:04 you see a round fire and the powder in the case hasn't fully burned before the shell is ejected. My gut feeling is with the lighter RSA, there is less resistance and the slide is moving milliseconds earlier than using a heavier spring. I ran the 150g Syntechs with the reduced factory RSA for the hell of it a couple weeks ago and had no problems with stovepipes. Might try it again and see if it makes a difference. I'm also going to see if my reloads with the fast burning Titegroup powder eliminates the late burn. I agree...I think it's a combination of a few factors with the root cause being the powder burn time. You have a reduced power RSA, do you have a corresponding reduced power striker spring? Sprinco RSA with 11# spring. FP spring is a Glock 28N. All my comp reloads with Titegroup have not shown any signs of late burning powder. Same setup I'm running. I also use titegroup. I haven't noticed any fireworks with mine, so basically seeing the same that you are.